Welcome to our 12th issue of "The eBullet." Here are highlights of what has been happening and info about several upcoming events (including the TV Land statue dedication and CBS-TV special) and some brand new Mayberry-related items (including a 2004 Mayberry wall calendar and Andy Griffith's Christmas CD and book). Raleigh, NC (October 2003) - Andy and Opie become one of TV Land's Landmarks. "TV Land, television's home to the best programming from the past 50 years, and the city of Raleigh, N.C., will honor 'The Andy Griffith Show' with a bronze statue capturing the show's famous opening sequence depicting Andy Griffith and a young Ron Howard in their roles of Sheriff Andy and Opie Taylor walking, hand in hand. The statue will be placed in the pastoral environment of Raleigh's Pullen Park and unveiled at a special ceremony there on Tuesday, October 28. Andy Griffith is scheduled to be joined on stage by Raleigh Mayor Charles Meeker and Larry W. Jones, General Manager and Executive Vice President, TV Land. The press release continues: "'Mayberry is a state of mind that represents the very best of the North Carolina culture - friendly, unpretentious, compassionate, fun-loving, decent and solid. As the capital of North Carolina, Raleigh is eager to welcome two such old and dear friends home. We can't wait to see Andy and Opie's statue and invite everyone in North Carolina, the country and TV Land to visit and embrace this graceful state of mind,' said Charles Meeker, Mayor, City of Raleigh. "'TV Land is honored to salute "The Andy Griffith Show" with a landmark celebrating this world wide family favorite,' said Larry W. Jones. 'The indelible impression of Andy and Opie walking hand in hand is TV Land's way of saluting the American family.'" And still more, "As part of TV Land's Landmark initiative, the 'Andy Griffith Show' sculpture represents the network's third effort to honor classic TV. The network's first salute - a bronze statue of Ralph Kramden of The Honeymooners - was unveiled in 2000 and now adorns the entrance to New York City's Port Authority Bus Terminal. In May 2002, a bronze statue of Mary Tyler Moore from The Mary Tyler Moore Show was unveiled and now stands on Nicollett Mall in downtown Minneapolis, Minn.
"Studio EIS, a three-dimensional design and sculpture studio in New York founded by brothers Ivan and Elliot Schwartz, created the life-sized bronze sculpture. StudioEIS' entry was selected following an invitation to select sculptors across the country earlier this year. The design selection was made by TV Land executives, Andy Griffith, Ron Howard and the city of Raleigh." Mt. Airy, NC (September 2003) - TAGS writer Earle Hagen shares his insights into the creation of "Mayberry." * Seeing three TAGS stars (Earle Hagen, LeRoy McNees and Billy Ray Lathum) play in the golf Tourney on Thursday. * Seeing three generations of actual Earlie Gilleys at the tourney banquet, attending with Virginia Lorraine Beasley Gilley, Andy Griffith's first cousin. The two youngest Earlie Gilleys played in the tournament. * Marveling at how the team of The Creatsters (Allan Colyar, Dean Colyar and Phil Henderson) and Neil Coleman managed to win both the Best Dressed Golf Team and the Barney's Bullet Award for the Highest Single Round for their play on the course (note to non-golfers: that means last place). They were terrible golfers, but they must have looked good doing it. * Witnessing Mark "Giggles" Gigliotti of King, N.C., reclaiming his Snappy Lunch Pork Chop Sandwich-eating Chomp-ionship by eating seven (or was it eight that he ate?) fully-dressed pork chop sandwiches during the 80th Anniversary year of Snappy Lunch. * Trying to convince yourself that you really did see Howard Sprague (Jeff Branch) playing maracas with the VW Boys. Mt. Airy, NC (September 2003) - Four time trivia winner Pat Bullins is escorted to the stage by Deputy Fife..
* Jumping with excitement as Pat Bullins won the Mayberry Days Trivia Contest (a.k.a. the Super Bowl of Mayberry Trivia) for fourth straight year. * Attending the marriage ceremony of Jennifer Cole and Craig Flockerzie on the steps of the old City Hall with Betty Lynn and Maggie Peterson as honorary members of the wedding party. * Doug Dillard and Rodney Dillard (along with Rodney's wife, Beverly, and daughter Rachel) performing together for the first time at Mayberry Days. * Being glad that Elvis-wannabe Phil Lee has to defer (most of the time) to Michael Hoover, so that we instead get to enjoy watching Phil pay outstanding tribute to Ernest T.
* Mike Johnson's outstanding design of the Mayberry Days T-shirt (and the Barney chapter parade T-shirts). * Charles Dowell at Snappy Lunch and Russell Hiatt at Floyd's for being there all year round for fans. * Ditto the Visitors Center, home of Emmett Forrest's amazing collection of Andy Griffith memorabilia (including the additions since last year of the actual signs from the front doors of the courthouse, donated by Emmett's pal, Andy Griffith). * Silent Auction total $3,157.50! * The Creatsters conducting and also winning the Horseshoe Pitching Contest. Hmmm. Just our luck...another horseshoe pointing the wrong way. * Enjoying heapin' helpin's of North Carolina State Barbecue Championship barbecue (the state championship was held as part of Mayberry Days this year). * Neal Brower's Lecture with special guest Earle Hagen. Forte! * The Creatsters (Who? Them AGAIN?) being awarded an honor they actually deserve: The Mayberry Friendship Award, presented to an individual or in this case a group of individuals acting as one who have done a lot to make modern-day Mayberry friendlier. Mt. 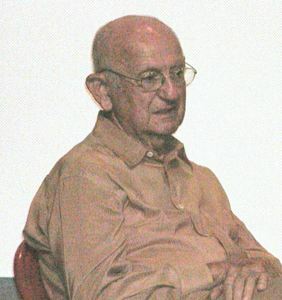 Airy, NC (September 2003) - "Jim Schwenke was one of the most kind and friendly people I ever met. This award is one that means a lot to me because the only time I ever met Jim Schwenke was at Mayberry Days in 1993. He and I wrote and phoned one another for eight years and to paraphrase our favorite deputy, 'Mayberry ain't never had a better friend than Jim Schwenke.' This award is not about me; it's about keeping the memory of a Mayberry spirit alive and well. Jim, we shall meet but we shall miss you and we will always have a smile on our face when we think of you." -- Allan Newsome. 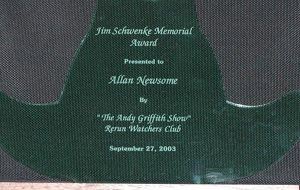 * Allan Newsome receiving the first annual Jim Schwenke Memorial Award, an award that's not unlike the Mayberry Friendship Award, except that this one honors the memory of one TAGSRWC's all-time most dedicated fans and has as its first recipient another one from the same mold. * Leaving it to George Spence to find a way to top his surprise of singing for us last year. This year he gave fans a most eloquent and moving recitation of a portion of the epic poem "John Brown's Body." * Maggie Mancuso singing and her talented sister Phyllis Eaton and husband Gus Mancuso playing piano together during Col. Tim's Talent Time. * Listening to Alma Venable, dressed as Aunt Bee, yodeling during Col. Tim's. * We guess that means we now have to mention that the Creatsters won First Place in bowling. * And for those who like to plan ahead, tickets for Mayberry Days 2004 are now on sale, too. Andy's autobiography, tentatively titled "I Appreciate It" and originally scheduled for release this fall, has been postponed until a later date to be announced. And Andy is executive producer of a CBS-TV retrospective on TAGS that is scheduled to air on Nov. 11. A film crew was in New Castle doing interviews during Mayberry in the Midwest II this summer. They also did some filming with key people in California. Here's where to go for a sneak peek, but don't go to this site if you'd rather be totally surprised when you tune in to watch the special on CBS: http://hostingprod.com/@andremika.com/hiddenandyone.html. Also, look for Andy to participate in CBS-TV's "75th Anniversary" special on Nov. 2. And "TV Guide" has interviewed Andy and DON KNOTTS for an upcoming issue about the Nov. 11th TAGS special and their memories about TAGS. Andy is also featured as the cover story for the October issue of North Carolina's "Our State" magazine. Ron's Imagine Entertainment is also producing or co-producing the holiday season's "The Cat in the Hat" and "The Alamo," as well as TV shows such as "24" and the new, edgy "Arrested Development." Imagine is also producing "Curious George," a film that probably will be held for release in 2004. Mt. 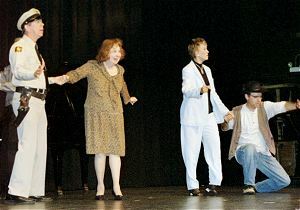 Airy, NC (September 2003) - The Mayberry Deputy (David Browning) and Betty "Thelma Lou" Lynn join Maggie "Charlene" Peterson and Ernest T. (Phil Lee) on stage for some foot stomping fun. RODNEY DILLARD is now helping produce televangelist Jim Bakker's new TV show, which originates from Branson. Rodney also serves as an announcer and comedian on the show, and he continues to supervise operations of Caravell Studios, a recording business in Branson. He also has a brand new CD called "I Wish Life Was Like 'The Andy Griffith Show'" (described in the merchandise section below). Mayberry's Country Boys member LeROY McNEES has also been at work in the studio and has produced a super new CD called "Smiles & Tears," which is filled with both funny and touching songs (see more in the merchandise section). It was a sad day in Mayberry and at Stalag 13 to hear the unexpected news that LARRY HOVIS died from esophageal cancer on September 9. He was 67. He was best known as Sgt. Andrew Carter on "Hogan's Heroes," but was beloved in Mayberry for his portrayal of Goober's nemesis Gilly "Speed, Speed, Speed" Walker in two episodes ("Goober Takes a Car Apart" and "The Case of the Punch in the Nose.") His other Mayberry-related connection was his portrayal of Larry Gotschalk on "Gomer Pyle, U.S.M.C." Larry Hovis was born on February 10, 1936 in Wapito, Wash., and followed a path in music and then acting. Along the way he played drums, made recordings as a singer, did stand-up comedy, was a writer, performed on Broadway and produced TV shows. He was one of the co-creators of "Rowan and Martin's Laugh-In" and was executive producer of other TV shows, including "The Liars Club." From 1990 until his death, he taught drama at Texas State University in San Marcos. Mayberry fans were treated to a memorable appearance by Larry at Judge Joel Laird's Mayberry Family Reunion in Birmingham, Ala., in October 2000. At the time of his death, plans were percolating for more Mayberry reunion appearances in 2004. You could not find a nicer person. He will be greatly missed. He was preceded in death by his wife, Ann. He is survived by four children. * NOW to NOV.9: DON KNOTTS appears in a production of "On Golden Pond" at the New Theatre Restaurant in Overland Park, Kans. Check http://www.newtheatre.com or call (913) 649-SHOW (7469) for updates. Tickets are on sale now. Be sure to mention that you're a member of "The Andy Griffith Show" Rerun Watchers Club when ordering. Don't "over-expect" what mentioning that might do to enhance your theater experience. Any possible enhancement may not be offered or available to you until show time. * OCT. 31: DAVID BROWNING shows his "pioneer moxie" for the Fall Festival at Tom Johnson's Camping Center in Concord, N.C.
* NOV. 2: TV Land airs "Inside TV Land: The Andy Griffith Show" followed by a marathon of TAGS episodes from 8 p.m. to Midnight ET/PT. * NOV. 11: The hour-long retrospective "THE ANDY GRIFFITH SHOW REUNION: BACK TO MAYBERRY" will air on CBS-TV. It's a must-see event for Mayberry fans. "Check your local listings for times." * NOV. 15: DAVID BROWNING emcees the Blue Ridge Jamboree at the Andy Griffith Playhouse in Mount Airy, N.C.
* NOV. 17 to 19 AND 21 to 22: DON KNOTTS and Tim Conway are in concert in Orilla, Ontario (matinees the first three days and evening shows on the last two days). * NOV. 21 and 22: DAVID BROWNING says "ay-ee" for holiday festivities at the Mall of Louisiana in Baton Rouge. * NOV. 22: GEORGE LINDSEY performs at the President Casino Broadwater Resort in Biloxi, Miss. For info, call 1-800-THE PRES or visit the venue's Web site at http://www.presidentbroadwater.com/ . * NOV. 28: THE ROLAND WHITE BAND performs at the Station Inn in Nashville. * DEC. 5 to 7: JIM NABORS hosts "A Merry Christmas with Friends and Nabors" at the Hawaii Theatre in Honolulu, Hawaii. Box Office Phone: (808) 528-0506. (Box Office Hours: Tuesday-Saturday from 9:00 AM -5:00 PM). Visit the website at http://www.hawaiitheatre.com/ . * DEC. 6: DAVID BROWNING participates in the Bristol Christmas Parade in Bristol, Va.
* DEC. 12 and 13: THE ROLAND WHITE BAND is among the groups performing during Bill Monroe Appreciation Nights at the Station Inn in Nashville, Tenn.
* DEC. 12: DAVID BROWNING performs his one-man "Scrooge" show at the Oakboro Music Hall in Oakboro, N.C. Visit the theater's Web site for more info: http://www.oakboromusichall.com/ . * DEC. 27: THE ROLAND WHITE BAND performs at the Station Inn in Nashville. * APR. 15 to 17: 7TH ANNUAL GEORGE LINDSEY/UNA FILM FESTIVAL on the campus of the University of North Alabama in Florence, Ala. Visit the festival's Web site at http://www.lindseyfilmfest.com/ . *Ticket to the Grand Ole Opry on Friday night, featuring a special "Tribute to Mayberry"
At this time, tickets to the events are limited and only available with an accommodations package. If all available tickets are not sold in packages, they will be made available for sale two weeks prior to the event. ONE MORE NOTE: The lineup of stars and other details will be announced as they become available. Stay tuned! ADVANCE LAWYER-SPEAK about the Gaylord Opryland autograph session: "Photographs will be available for sale by most stars. Cast members have the right to refuse to autograph personal memorabilia and may sign for a limited time period only." In other words, as Andy told Gomer about his upcoming date with Mary Grace Gossage, "Don't over-expect." * JULY 4: North Carolina and, in particular, Mayberry are featured in the LIBERTY DAY salute in Lawrenceburg, Tenn., which has started a tradition of saluting a different state each year on the Fourth of July. It's likely that one or more cast members will be invited to attend. * JULY 9 and 10: MAYBERRY IN THE MIDWEST III in New Castle, Ind. These dates are still TENTATIVE, but they are looking very good, according to organizer Curt Bell. Watch the Event Calendar at http://tagsrwc.com/ and future issues or our newsletters for updates. The event's Web site is: http://tagsrwc.com/http://www.mayberryinthemidwest.com/. Mt. 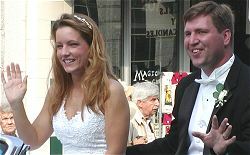 Airy, NC (September 2003) - Jennifer Cole and Craig Flockerzie were married on the old town hall steps following the Mayor's proclamation. Betty Lynn and Maggie Peterson were there to witness the joining of this wonderful couple. Here's wishing them a wonderful live and many andyversaries spent at Mayberry Days. * SEPT. 23 to 25: 15th ANNUAL MAYBERRY DAYS in Mount Airy, North Carolina. Tickets are on sale now. Visit http://www.surryarts.org/ for complete ticket info. One new twist for 2004: A single $5.00 ticket will admit you to both Neal Brower's Lecture and the TAGSRWC Annual Meeting that follows it (the dinner part of the meeting has been discontinued). There will be a brief intermission for people to leave or come in between the lecture and the meeting, which will remain separate activities, but the Cinema won't be "cleared" for a ticketed re-admission as in previous years. We suggest that you regularly check the Events Calendar at http://tagsrwc.com/ for more information and updates about these events and others that might be added between now and the December issue of "The eBullet." New items since the last August "eBullet" include the "2004 Andy Griffith Show Calendar," Andy Griffith's "The Christmas Guest" book (with a two-song CD single) and the full-length "Christmas Guest" CD. Also brand new are wonderful CDs by both Rodney Dillard and LeRoy McNees. And we now have several Don Knotts movies that have just been released for the first time on DVD. Also, we have the brand new "Fearless Fife" tin box and "Bloodhound of the Law" light switch plate. In the last "eBullet" we mentioned that we were about to stock some great new Mayberry REFRIGERATOR MAGNETS and 23 different MAYBERRY GREETING CARDS. They're all online now. Other items added to our lineup recently include specially autographed copies of Don Knotts' memoirs "Barney Fife and Other Characters I've Known," a new CD featuring 5 comedy routines by Don Knotts and 5 routines by Andy Griffith (called "Back to Back Comedy" and 3 Mayberry street signs. The 2004 calendar (the first one since 2000 and only the fourth Mayberry calendar ever) features black & white photos from scenes featuring Andy, Barney, Opie, Aunt Bee, and Gomer. (See the back cover image online for a look at all 12 photos.) The calendar measures 11 x 12 in. This Christmas gift book/CD single is the companion to Andy Griffith's new Christmas Guest CD (below.) The handsomely illustrated hardcover book measures 6 x 6 inches and has 64 pages. Here's how the publisher describes the book: "The hero in this classic story of delight and despair, sacrifice and celebration, shows us the beauty of a life where Jesus is not just a guest in the home, but a resident in the heart. Andy Griffith brings new life to this timeless tale. Included in the back cover of the book is a CD that has a narrative of the story by Andy Griffith." The CD single with the book also features Andy singing "Go Tell It on the Mountain," from his new Christmas album. Cover price of the book is $15.00, but our price is just $12.00. This brand new collection of favorite Christmas songs and stories is sure to become a holiday classic. It's hard to beat Andy Griffith for filling the Christmas season with real down-home comfort and joy. Here are the dozen stories and songs included in this collection. 3. O Come, O Come Emmanuel/What Child Is This? BUY THE BOOK AND FULL-LENGTH CD TOGETHER AS A COMBO AND SAVE EVEN MORE! "The Christmas Guest" book/CD single and full-length CD have a suggested price of $33.00. Our discounted price for the two when bought separately would total $28. But select our combo with both together and the cost is only $25.00...almost 25% off for what are sure to be two of the holiday season's hottest gifts! It's a super CD of toe-tapping music that's sure to prompt many smiles and maybe a few tears (the good kind). Price: $15.00. Also, a special combo price with another of LeRoy's fine CDs is available online at Weaver's. Several of Don Knotts' most popular movies have been released on DVD this fall and Weaver's is carrying most of them. We offer "THE GHOST AND MR. CHICKEN," "THE RELUCTANT ASTRONAUT," "THE SHAKIEST GUN IN THE WEST" and "HOW TO FRAME A FIGG" (each at $16.00) and Disney's "THE APPLE DUMPLING GANG" for $22.00. We also carry other Don Knotts films on DVD, including the classic "THE INCREDIBLE MR. LIMPET" ($25.00). And we still carry several of these and other Don Knotts movies on VHS tapes, as well as a couple of Andy Griffith's best: "A FACE IN THE CROWD" and "NO TIME FOR SERGEANTS." We're very pleased to be able to offer copies of this autobiography that are specially autographed by Don Knotts himself. We have a limited number of these autographed books. Don has individually signed plain nameplates with a gold border that are pasted on the inside of the front cover. He signed (in permanent blue marker) the nameplates expressly for these books. We think this offer is quite an extraordinary bargain because the book itself is an interesting story of Don's life in his own words that has a cover price of $13.00. For just $9 more, you get a book signed by Don. A real keepsake for any fan. Price: $22.00. "North Carolina, My Home State"
* TWO NEW T-SHIRT DESIGNS: "ANDY & BARNEY: MANHUNT" and "PICTURES IN LETTERS" T-SHIRT. We've recently added three pressed tin Mayberry street signs: Andy Taylor St., Opie Taylor Ave. and Barney Fife Blvd. Each sign has raised white lettering on a green background and measures 24 in. long x 5 in. high. The signs are $13.00 each or a Set of All 3 for $36.00. This fun CD by the popular VW Boys features the deliciously catchy title-cut tribute to the famed café in Andy Griffith's hometown of Mount Airy, N.C. Among the other dozen songs are guest vocalist Gary Wedemeyer's Briscoe Darlingesque rendition of "Low and Lonely" and the sentimental "Carolina Town." There are interesting bits of conversation throughout the CD, including a nice visit with Snappy Lunch owner Charles Dowell. The "enhanced" CD also includes photos and a video. All we can say is, "Order up!" section are "M*A*S*H," "The Honeymooners," "I Love Lucy," "Bewitched,"
Dr. Seuss), Superman and Batman items. wholesome TV shows and pop culture icons. We figure it might be especially handy for Mayberry fans who are doing holiday shopping for folks who have an interest in other TV shows. Only a couple of new chapters have started since the August issue of "The eBullet." But what they lack in numbers, they make up in the length of their names. The official inscriber of Chapter Charters has gone into hiding! "I Ain't Talkin', I Ain't Talkin' -- The More You Ask, the More I'm Balkin" Lawrenceburg, Tenn.
"Aunt Bee, She'll Brang You Some Chicken an' Dumplin's an' Sweet 'Tater Pie for Supper" Oconomowoc, Wisc. If you are interested in starting a chapter of TAGSRWC, all you have to do is pick a name that has not already been chosen and submit a list of your founding members by postal mail. Or write to us also if you would like to contact a chapter near you. Our address is TAGSRWC, 9 Music Square South, PMB 146, Nashville, TN 37203-3286. Our online TAGSRWC chapter, "Who's Been Messin' Up the Bulletin Board?" raised a whopping $3,157.50 for the Surry Arts Council during its Silent Auction at Mayberry Days. Organizer JEFF KOONTZ (sa-lute!) wishes to express his gratitude to all who contributed items for the auction -- including many very clever and one-of-kind crafts and artwork and other rare finds -- and to those who made bids on items. Funds for from the auction, which is the chapter's major charitable fund-raising event each year, support the Art Council's efforts with Mayberry Days. In its more-or-less annual report to HQ, the KIT-KAT CLUB (Salem, Ore., and Northern California) filed this update: "We're pleased to announce that a little bit of North Carolina has come to Salem. The Smokin' Swine Publick House features Carolina-style barbecue. The entrance is decorated with TAGS and Mayberry memorabilia. Jim Lindsey would appreciate the bi-monthly bluegrass jams held there." MAYBERRY chapter (Knoxville, Tenn.) turns out a really swell newsletter, "The Mayberry Minutes" (12 pages on actual paper) that's published quarterly. Or check them out at http://www.mayberrychapter.com/ . They seem to have at least one envoy at just about every Mayberry happening within 500 miles of Knoxville.
" NEVER HIT YOUR GRANDMA WITH A GREAT BIG STICK" chapter (Tifton, Ga.) had a sure-enough Mountain Wedding when bride Leeann Drabenstott and groom/"Never Hit" founder Albert Culbreath were married under a big pine tree at the Culbreath family farm on Oct. 11 in Hartselle, Ala. The bride wore a lovely bridal gown and cowboy boots. The groom and his groomsmen wore well-pressed overalls. (By the way, Liberty brand was the official wedding overalls.) A bluegrass band performed. Instead of throwing rice, the congregation threw peanuts (goobers, if you will). Cider (but not hard) was served during the ceremony. The groom summed up his delight at the reception by saying "Shazam!" Among the TAGSRWC chapters on hand to witness the beautiful occasion were "PEPPERELLI PIZZA" (Raeford, N.C.) and ANDY chapter (Nashville, Tenn.). We're running long in this issue, so we'll cut our "Chapter News" short this time. But in a nutshell, most of the recent news from chapters has involved attending Mayberry Days (at least 60 chapters! ), planning Mayberry-themed Halloween gatherings and preparing to get together to watch the CBS special on Nov. 11th, and in some cases attending the TV Land statue unveiling in Raleigh from as far away as Nebraska (that would be "I WAS A PAWN I THE HANDS OF A WILY WOMAN" in Plainview). The deadline has passed for entering this quiz, which was published in the August issue. There were lots of good entries. The answers and name of the prize-winner will be published first in the November issue of "The Pocket" and then in the December "eBullet." As Otis once said, "Wait and see. Wait and see!" * MAKING MR. MARCONI PROUD -- From an Official Press Release: "Downtown Mount Airy, Inc., is providing patrons of the historic shopping district with free email and Internet service. Thousands visit Mount Airy, population 8,500, in search of the real Mayberry. Now, these visitors can come to Mount Airy armed with their laptops or handheld computers and can sit in the SNAPPY LUNCH or FLOYD'S CITY BARBER SHOP and email their family and friends back at home. Business professionals can also use the service to keep in touch with contacts while at lunch. The free Internet zones will be distinguished by an Internet Hotspot Sign on merchants' doors. "Short for wireless fidelity, Wi-Fi broadcasts Internet connections via radio waves allowing its users to trade out their Internet cables for built-in Wi-Fi modems. A Wi-Fi partnership was developed by the Greater Mount Airy Chamber of Commerce." So much for ever needing bigger wires. We're pleased to announce that comedian/actor BERNIE MAC is the newest Honorary Member of TAGSRWC. He is a lifelong fan of TAGS, having watched it for years in reruns on Superstation WGN in his hometown of Chicago. He has often been quoted as saying that TAGS is his favorite show. He especially admires Andy's example of parenting. In fact, Bernie's such a big fan that he recently told "TV Guide" that he's even trying to find a way to feature Andy Griffith on his "Bernie Mac Show" on Fox-TV. Stay tuned. "I wanted to let everyone know that 'Howard' took 1st Place in the Montgomery County Road Rally in North Carolina. Our local Chamber Commerce hosted the race. My captain at the Sheriff's Office where I work served as my navigator and I drove the Mayberry Car. After the three-hour race, the computer crashed at the final checkpoint and we were not able to find out the results. I was later notified that the Mayberry Car had the best time out of 33 cars. On the front page of our local paper it read, 'Mayberry Car Takes Gold Nugget Rally in Montgomery County.' I told them thanks and Happy Motoring!" It sounds to us like "Howard," who was an Official Starter at this year's Mayberry Squad Car Nationals in Brent, Ala., may have an assignment behind the wheel at next year's Nationals. Between issues of "The eBullet," keep up with the goings-on in Mayberry with the more-or-less daily "Who's Been Messin' Up The Bulletin Board?" Digest. It's a free subscriber list that consists entirely of comments, news flashes, and questions and answers from subscribers. You can sign up for that list by going to the "Mailing Lists" link at http://tagsrwc.com. TAGSRWC also publishes the "Weaver's Newsletter" in more-or-less alternate months to "The eBullet." Like "The eBullet," the "Weaver's Newsletter" is free. Its focus is mainly on new Mayberry merchandise and collectibles and quick news flashes. To sign up go to http://tagsrwc.com/ebullet/joinebullet.htm. "The Pocket" is continuing with additional issues for 2003 and 2004. There are several subscription options for brand new subscribers. All previous subscriptions to "The Pocket" expired with the November 2002 issue. Renewals for all subscribers can be done online right now at http://tagsrwc.com and through the renewal form in the current (November 2003) issue of "The Pocket." Or you can receive for a free sample issue by writing TAGSRWC, 9 Music Square South, PMB 146, Nashville TN 37203-3286 and sign up with the form provided. The first two issues of "The Pocket" for 2003 were in March and July. The final 2003 issue should be out around Thanksgiving. TAGSRWC's other main vehicle for Mayberry information is simply our Web site at http://tagsrwc.com. It has extensive content and links for just about everything a Mayberry fan might be looking for. The next issue of "The eBullet" is scheduled for December.